This extra thick, low-sugar blueberry coconut smoothie features two secret healthy ingredients: cauliflower and zucchini! 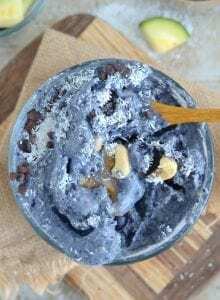 You’ll never guess they’re in there though, this smoothie tastes like blueberry ice cream but it packed with loads of nutrition and health benefits. Add the coconut and liquid to a high-speed blender and blend on high for about a minute. Add the rest of the ingredients and pulse until thick and creamy. To prevent it from thinning out, don’t over-mix or let run too long as the heat from the blender will melt it. Scoop the mixture into a bowl, add your favourite toppings and enjoy with a spoon! To make this a drinkable smoothie, increase the liquid to 1 cup then slowly as more as needed to reach desired consistency.